Czech President receives 'Shield of Jerusalem' award. Minsiter calls on Europe to follow Czech Republic's example. 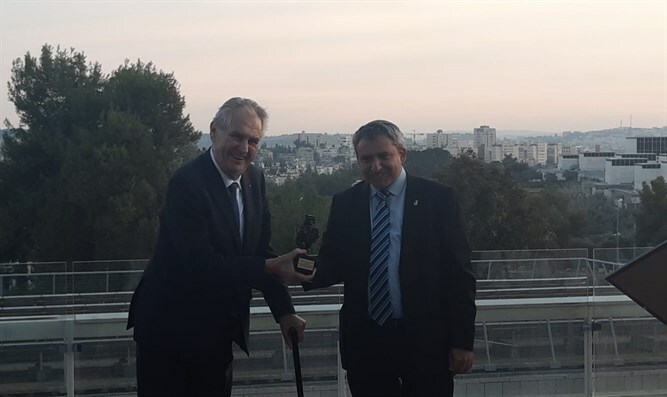 Jerusalem Affairs Minister Ze'ev Elkin presented the 'Magen Yerushalayim' (Shield of Jerusalem) to the President of the Czech Republic, Milos Zeman, on Monday. President Zeman is visiting Israel on the occasion of the opening of the Czech House, a diplomatic mission which serves as the first step towards the relocation of the Czech embassy to Jerusalem. The award ceremony was held in the office of the Speaker of the Knesset in the presence of MK Yuli Edelstein and Prime Minister Binyamin Netanyahu. Elkin said at the event: "President Zeman has been a true friend of the State of Israel and for years. In contrast to the prevailing attitude in the European Union, he promotes the recognition of Jerusalem as the capital of Israel and works to promote the transfer of the Czech embassy to Jerusalem." "The time has come for the countries of the European Union to recognize the simple truth that united Jerusalem is the eternal capital of the Jewish people and the State of Israel, and it is only natural that the Czech Republic, which was among the first countries to extend its hand to Israel during the War of Independence, will also be among the first countries to take part in promoting recognition Jerusalem as the capital of the State of Israel vis-a-vis the European Union," said Elkin. The Jerusalem Affairs Ministry established the Jerusalem Shield award last year in order to honor people from all over the world who, in their unique work, have worked to secure recognition of a united Jerusalem as the capital of Israel. In May, US President Donald Trump became the first recipient of the award for recognizing Jerusalem as the capital of Israel and relocating the US embassy to Jerusalem. President Zeman is the second person to receive the Magen Yerushayalim award.